either that was a special joke or a super wild secret what you whispered in the eary of your friend… can you share it with me too? 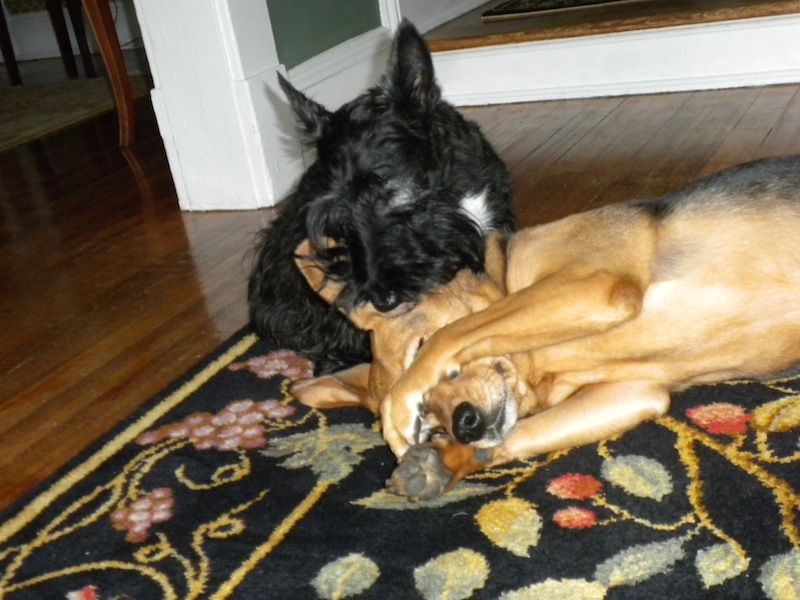 OK..here goes: There once was a Scottie named Stuart, who liked to lick ears just to do it. He licked an ear here and licked an ear there, when he was done he’d just stew it. HAAA! THAT MAKES NO SENSE! And neither did what I was whispering to my pal, Sniglet. Why are Scotties so obsessed with ears? Are we? I guess so. Who knows! Stuart, it looks as if you have a wonderful pal! Friends are the greatest! She’s my pal. You’re so right about friends! You can’t have too many! You have 2 of the three monkeys. There’s “see no evil” and “nibble no evil” but where’s the third? ….ahh, maybe he didn’t want his picture taken and was hiding? were you whispering sweet nothings in that ear? Blowing sweet nothings into Sniglet’s ear, oh Stuart you are so romantic. You should see me when I gnaw on her leg! X-rated. You must be telling him an evil joke, Stuart! Something sinister? Maybe. I’ll never tell. Is ya trainin’ ta be an ear vet? Cuz it looks like yer givin’ it da once-ovfur! It does look like that doesn’t it? Funny. I’d gnaw on your ear if you’d scratch my belly. Well, maybe not “gnaw” – just a little bite. Nibble. She never does. Love her to pieces. Hola Janis! Welcome to The Scottie Chronicles! This is my friend Sniglet. She loves it when I lick her ears. I share my secrets with her and she never tells.